We encourage every employee at Lanco to develop these three dimensions of Leadership, Entrepreneurship and Ownership. The three dimensions are interrelated and interdependent, and it is the synergy between these three that is the key to success - and to owning the spirit of Lanco. Leadership at Lanco is an interpersonal influence process of setting direction and inspiring people to achieve challenging goals. Leaders inspire and influence through their behaviour of embracing the idea of being a role-model by setting an example and motivating people by involving them in problem solving and decision making processes. Entrepreneurship is being accountable for the profitability and growth of the business. Our people develop a compelling vision of the future. They search out challenging opportunities to grow, innovate and improve. They experiment, take risks and learn from their mistakes. They have a strategic mindset and always work towards the next goal. Ownership in Lanco is to recognise the organisation's interest as supreme, above individual preferences and goals. Owners put the organisation before self in all decisions, actions and dealings. Ownership is dependent on personal traits and starts with having faith in one self. It is demonstrated through a passion for work, and the ability to turn every day adversity into an opportunity. It also means working towards a purpose, taking pride in the purpose, having patience, and perseverance - never giving up till the purpose is accomplished. LEO is a scientific approach that places the right people in the right roles by measuring and matching talent as well as a transparent mechanism to grow people within the organisation. The framework is instrumental in identifying learning and development needs of our people, and in inspiring and motivating them to learn and develop. 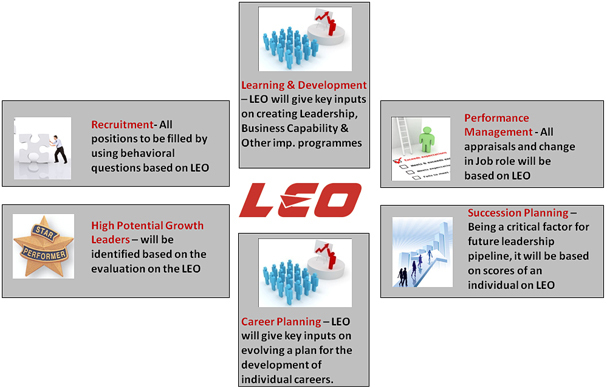 At Lanco, the LEO framework is integrated with all the people processes such as recruitment, learning and development, performance management, succession planning, career planning, and creating high potential growth leaders. It is the core of all human resource processes that enables alignment of individual goals and the organisation's vision for the future.